This study was conducted to evaluate the pathological changes in broilers fed a diet containing low-levels of a?atoxin (AF) and clinoptilolite (CLI) until 42 days of age. A total of 576 one-day-old Ross-308 type broiler chicks were treated with varying levels of AF and CLI (15 gkg-1). The gross and histopathological changes in the liver, kidneys, spleen, thymus and bursa of Fabricius were investigated and relative organ weights were calculated. Compared to controls, signi?cant changes (P < 0.05), such as slight to mod?erate hydropic degeneration and/or fatty change (8 cases of 10), bile-duct hyperplasia (7 of 10) and periportal ?brosis (5 of 10), were found in chicks fed 100 ppb AF-containing diet. No gross?pathological changes were observed in any treatments. The addition of CLI to the 100 ppb AF-containing diet signi?cantly decreased the number of affected broilers and/or the severity of lesions (hydropic degeneration and bile-duct hyperplasia) in the livers (P < 0.05). The addition of CLI to the AF-free diet did not produce any sig?ni?cant lesions compared with the controls. ? 2004 Published by Elsevier Ltd.
A?atoxins (AF), potent mycotoxins produced by Aspergillus ?avus and Aspergillus parasiticus, are a ma?jor concern in the poultry production. The toxicity of AF in broiler chickens has been widely investigated by the determination of their carcinogenic, mutagenic, tera?togenic (Wild et al., 2000; Sur and Celik, 2003) and growth inhibitory (Oguz and Kurtoglu, 2000) effects. The biochemical?haematological (Oguz et al., 2000a), immunological (Qureshi et al., 1998) and pathological (Dafalla et al., 1987; Kiran et al., 1998) toxic effects of AF have also been well described. Contamination of AF in feed causes a?atoxicosis in poultry production characterised by listlessness, ano?rexia with lowered growth rate, poor feed utilisation, decreased weight gain, decreased egg weight and pro?duction, increased susceptibility to environmental and microbial stresses, and increased mortality (Leeson et al., 1995). AF can also cause important gross and microscopic changes in the liver, such as hepatomegaly, paleness, hydropic degeneration, fatty change, bile-duct hyperplasia and periportal ?brosis (Espada et al., 1992; Fernandez et al., 1994; Ledoux et al., 1999; Ortatatli and Oguz, 2001), kidney and spleen lesions (Glahn et al., 1991; Bilgic and Yesildere, 1992), unfavourable repro?ductive changes (Ortatatli et al., 2002), impairment of the humoral and cellular immune responses and increase susceptibility to some environmental and infectious agents (Ibrahim et al., 2000; Oguz et al., 2003). Producers, researchers and governments aim to de?velop effective prevention management and decontami?nation technologies to minimise the toxic effects of AF. Besides of the preventive management, relatively new approaches have been employed including physical, chemical and biological treatments to detoxify AF in contaminated feeds and feedstuffs (Parlat et al., 2001). Since the beginning of 1990s, the adsorbent-based stud?ies have been performed to remove AF from contami?nated feed and minimise the toxicity of AF in poultry (Ibrahim et al., 2000). Zeolites (Miazzo et al., 2000), bentonites (Rosa et al., 2001) and clinoptilolite (CLI), which is a natural zeolite and a member of heulandite? stilbite group (Oguz and Kurtoglu, 2000; Oguz et al., 2000a,b), were preferred because of their high binding capacities for AF and their reducing effect on AF-absorption from the gastrointestinal tract. The gross and histopathological changes in the target organs of AF in broilers have been widely investigated with higher AF levels in feed (1?5 ppm; mg kg -1) in the studies reviewed above. Also, the AF-detoxi?cation stud?ies have been employed with higher AF levels and in short-term periods. Therefore, the purpose of the present study was to evaluate the gross and microscopic changes in a?atoxicosis induced by low-levels (50 and 100 ppb) and chronic (42 days; one broiler production period) AF exposure, and to determine the possible preventive role of dietary CLI on the pathological changes examined. Five hundred and seventy-six one-day-old, Ross-308 type broiler chicks of both sexes were obtained from a commercial hatchery. Individually weighed chicks were divided at random into six groups. The chicks were housed in electrically heated compartments with contin?uous lighting and were fed a commercial feed starter (maize and soybean based, 230 g protein, 13.80 MJME kg -1) upto 21 days and thereafter a grower diet (215 g protein, 13.60 MJ ME kg -1) upto 42 days. Chickens were allowed access to the diets and water ad libitum. The starter and grower basal diets were both supplemented with amino acids, minerals and vitamins at levels recommended by National Research Council (NRC, 1994). The basal diets were tested for possible residual AF before feeding (Howel and Taylor, 1981), and there were no detectable levels present (detection limit: 1 lgkg -1 feed; recovery of the extrac?tion method: 95%). (4) 50 ppb AF + CLI: Basal diet + 50 lg AF+15 g CLI kg -1 diet; (5) 100 ppb AF: Basal diet + 100 lg AF kg -1 diet; (6) 100 ppb AF + CLI: Basal diet + 100 lg AF+15gCLIkg -1 diet. A commercially available CLI (KNa2Ca2(Si29AL7)O72 ? 32H2O) was provided from the west region of Turkey (Incal Mining Ltd., Izmir, Turkey). The AF was produced from A. parasiticus NRRL 2999 culture (USDA, Agricultural Research Service, Peoria, IL) via fermentation of rice by the method of Shotwell et al. (1966) with minor modi?cations by Oguz (1997). Successfully fermented rice was then steamed to kill the fungus, dried and ground to a ?ne powder. The AF content in rice powder was analysed by the method of Shotwell et al. (1966) and measured on a thin layer chromatography (TLC)? ?uorometric densitometer (Ca-mag-III, Basel, Switzerland). The AF within the rice powder consisted of 72.51% AFB1, 14.05% AFB2, 9.78% AFG1 and 3.66% AFG2 based on total AF in the ground rice powder (detection limit: 1 lgAF kg -1 rice powder; recovery of the extraction method: 92%). The rice powder was added to the basal diet to provide the required amount of 50 and 100 ppb (lgkg -1 feed). When the chicks reached 42 days of age, the feeding trial was terminated and 10 broilers from each treatment were selected at random and killed for pathological examination. [Other chicks in the groups were used for the other parts of this project, in which the performance and immunological investigations were performed, and the ?ndings were published previously (Oguz et al., 2000b; Oguz et al., 2003)]. Selected animals were weighed before being killed. A detailed necroscopy was then conducted. The liver, kidney, spleen, thymus and bursa of Fabricius were removed and weighed. The rel?ative organ weights (weight of organ/100 g live body weights) were calculated. Tissue samples from these or?gans were collected in 10% neutral buffered formalin. After ?xation, samples were dehydrated in alcohol, cleared in xylene and embedded in paraffin wax. Sec?tions were cut at 5 lm and stained with haematoxylin and eosin (Thermo Shandon, 15275, USA). Some sec?tions were also stained by the methods of van Gieson and Periodic Acid Shiff staining (Luna, 1968). Buffered formalin-?xed liver samples were sectioned by cryostat at 10?12 lm and stained for lipids using Sudan black staining method (Luna, 1968). Microscopically, hepatocellular degeneration in livers was graded as follows; Slight (degree 1): Mild hepatocellular swelling due to hydropic degeneration and fatty changes only in centril?obular areas. Moderate (degree 2): Clear hepatocellular swelling in both centrilobular and midzonal areas. Severe (degree 3): Diffuse and severe hepatocellular swelling, cytoplasmic paleness and rupture (this grade was not seen in any treatment). The differences among the relative organ weights were analysed by Duncan's multiple range test. The dif?ferences among the pathological changes were also determined by v 2 test (SPSS, 1999). Statements of statis?tical signi?cance are based on a P < 0.05 signi?cance level. The results, presented in Tables 1 and 2, show the ef?fects of dietary treatments on relative weights and histo?pathological changes of organs. No statistical differences were found in relative weights of liver, kidney, spleen, thymus and bursa of Fabricius (Table 1). Also, no gross?pathological changes were observed in the treat?ment groups. Microscopically, the livers in chickens fed diet con?taining 100 ppb AF showed signi?cant lesions (P < 0.05), compared to control, such as slight to mod?erate hydropic degeneration and small fatty vacuoles in hepatocytes in centrilobular and midzonal areas (8 cases from 10; Fig. 1(a)). 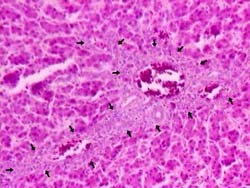 In the livers of some chickens in this group, a small amount of bile-duct proliferation located in portal areas (Fig. 2) and periportal ?brosis (Fig. 3), which was extending towards neighbouring portal triads, was also seen (7 and 5 cases, respectively; Table 2). The addition of 50 ppb AF to the diet caused very mild and statistically insigni?cant (P > 0.05) histo?pathological changes in livers in only 3 chicks, compared to controls. On the other hand, chicks fed 100 ppb AF also had lymphoid depletion in bursa of Fabricius (6 cases from 10; Fig. 4(a)) and slight tubular degeneration in the kidney (3 from 10). There were no considerable le?sions in spleens and thymuses in the groups examined, except for very light lymphocytic depletion and cortical atrophy in a few cases. Values represent the mean ? SEM of six groups of 10 broiler chicks each per treatment. No statistically differences were found within the treatments according to the Duncan's multiple range tests. The values represent the number of chicks showing changes/number of chicks examined in each treatment group. Values within lines with no common superscripts are significantly different (P < 0.05), according to the v2 tests. Fig. 1. Comparative microscopic appearance of livers. (a) 100 ppb AF-treated group. Moderate hydropic degeneration and vacuoles in hepatocytes (arrows), (b) 100 ppb AF plus CLI group. 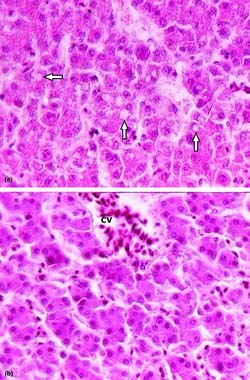 Normal aspect of unaffected hepatocytes from AF exposure and a hyperemic central vein (cv). H & E ? 650. The addition of CLI (15 g kg -1) to 100 ppb AF-con?taining diet (Group 6) partially decreased both the inci?dence of affected broilers and the severity of lesions in the organs investigated in this study (Table 2, Figs. 1(b), 4(b)). Especially, the improvements in the severity of hydropic degeneration and in the bile-duct hyperpla?sia in livers were signi?cant (P < 0.05). The addition of CLI to the AF-free diet (Group 2) did not cause any sig?ni?cant gross and microscopic changes in chicks when compared with the control birds (Table 2). The gross and microscopic investigations in the pre?vious studies showed that AF affected the organs belonging to the haematopoietic, immune and reti?culo-endothelial systems (Dafalla et al., 1987; Qureshi et al., 1998; Ortatatli and Oguz, 2001). In this study, the toxic effects of AF and the ameliorative efficacy of dietary adsorbent (CLI) on the detrimental effects of AF were investigated in the point of pathological to be target organs for AF and these AF levels that affect broilers in terms of performance, are primarily affected in a?atoxicosis cases. The partic-haematology, enzyme biochemistry, immunology and ular aim of this study was to induce chronic a?atoxi-histology. In this study, the toxic effects of AF on liver, cosis in broilers during one broiler production period kidney and bursa of Fabricius have been clearly observed (42 days) with lower AF levels (50 and 100 ppb), by feeding 100 ppb AF fed for 42 days (Table 2; Figs. 1(a), which may naturally occur under ?eld conditions. 2, 3 and 4(a)). However, it cannot be concluded from the present investigation that whether 50 ppb AF level causes effects of AF on the target organs with higher levels of AF a?atoxicosis in broilers as no signi?cant difference was observed compared to the control group (P > 0.05). This critical AF level (100 ppb) has been supported by other studies that reported the clinical, haematological? biochemical and histopathological changes began at 100 ppb onwards in feed in broilers (Giambrone et al., 1985; Marquez and Hernandez, 1995; Khajarern and Khajar?ern, 1999). The published report on performance of the same broilers used in this study showed that 100 ppb AF in feed signi?cantly reduced the performance of chicks (Oguz et al., 2000b) in agreement with the patho?logical results in the present study. However, the humoral immunity of these chicks was affected in the lower AF dose (50 ppb) in feed (Oguz et al., 2003). Fig. 2. Liver from 100 ppb AF-treated group Bile-duct proliferation (arrows) and mononuclear cells infiltration in the portal triad and mild hydropic degeneration of hepatocytes. H & E ? 260. That no macroscopic changes were found even in tar?get organs in this study could be due to the lower levels of AF used. However, even if mild, some histopathological changes (Table 2) were seen in liver, kidneys and bursa Fabricii from the chicks receiving the 100 ppb AF-alone diet. This observation suggests that a reliable evaluation could not be performed by macroscopic investigations of organs alone and that histopathological examination was also important. At the same time, the moderate his?topathological changes observed in this study are in agreement with the results of previous studies performed by various lower levels of AF (100?500 ppb) in broilers (Giambrone et al., 1985; Marquez and Hernandez, 1995), laying hens (Dafalla et al., 1987), ducks (Sell et al., 1998; Khajarern and Khajarern, 1999) and wild turkeys (Quist et al., 2000). Previous studies have stated that the periportal ?brosis and bile-duct hyperplasia ?ndings, in particular, may constitute chronic a?atoxicosis cases and indicate the regenerative changes in the liver. Espada et al. (1992) have also reported that vacuolation of liver cells and cellular depletion in the follicle medulla of the bursa Fabricii appeared ?rst and persisted during the recovery phase in experimental a?atoxicosis. These ?nd?ings support our results, indicating that chronic a?atoxi?cosis can be produced by feeding lower levels of AF (100 ppb) over a long-term period (42 day, one broiler pro?duction period). Fig. 3. Liver from 100 ppb AF-treated group. 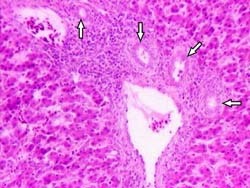 Periportal fibrosis extending towards neighbouring portal triad and into the lobulus (surrounded with arrows) H & E ? 260. The second aim of this study was to evaluate the possible preventive effect of CLI, which was simultane?ously added to the broiler feed for 42 days. The addi?tion of CLI (15 g kg -1) to the AF-containing diet (group 6) partially reduced the severity of lesions in the organs examined (Table 2, Figs. 1(b) and 4(b)). The bene?cial effect of CLI in this study might be attributed to act as a sequestering agent against AF in feeds through its adsorption and thereby reducing the AF bioavailability in the gastrointestinal tract, such as other zeolites (Harvey et al., 1993; Miazzo et al., 2000). The CLI?AF interaction involves the formation of complex by the B-carbonyl system of the AF with free radicals of the adsorbents (Bailey et al., 1998). Pre?vious studies have reported that the addition of CLI (15 gkg -1) to the high AF (2.5 ppm)-containing diet signi?cantly reduced the growth inhibitory effects of AF (Oguz and Kurtoglu, 2000) and biochemical?haem?atological toxic effects (Oguz et al., 2000a) in broiler chicks fed for 21 days. Fig. 4. Bursa of Fabricius. (a) 100 ppb AF-treated group. Moderate lymphoid depletion (Ld) in the centre of follicles, (b) 100 ppb AF plus CLI group. Unaffected normal follicles. H & E ? 65. In the long-term trials, which were the other parts of this study, an intermediate amelioration was ob?served in the adverse effects of low AF levels (100 ppb) on growth inhibitory (Oguz et al., 2000b) and immunotoxic effects (Oguz et al., 2003) of AF in broil?ers by dietary CLI (15 g kg -1). CLI also provided sig?ni?cant improvements on performances of Japanese quail by the addition of CLI to the AF (2 ppm)-con?taining diet for 35 days (Parlat et al., 1999). However, Harvey et al. (1993) found no bene?cial effect on broi?ler chicks by adding CLI (5 g kg -1) to an AF (3.5 ppm)-containing diet for 21 days. The reason for these differences may be due to the different type, dose, and physical characteristics of CLI, concentration of AF in the diet or the broiler strain used in the trials. CLI has also been known as an inert and non-toxic matter for poultry (Olver, 1997; Oguz and Kurtoglu, 2000). Our ?ndings have supported these reports, because the addition of CLI (15 g kg -1) to the AF-free diet (group 2) did not cause any adverse effects on investi?gated parameters in this study (Table 2) as indicated by Ortatatli and Oguz (2001). These results clearly demonstrated that slight and moderate histological lesions were observed in chick?ens fed a diet containing 100 ppb AF while no macro?scopically lesions were seen and that the simultaneous addition of CLI to the AF-containing diet provided a moderate amelioration in AF toxicity. Furthermore, CLI was inert and non-toxic for broilers. These improvements should contribute to a solution of the AF problem in broiler chickens, when used with other mycotoxin management practices. Bailey, R.H., Kubena, L.F., Harvey, R.B., Buckley, S.A., Rotting?haus, G.E., 1998. Efficacy of various inorganic sorbents to reduce the toxicity of a?atoxin and T-2 toxin in broiler chickens. Poultry Science 77, 1630?1632. Bilgic, H.N., Yesildere, T., 1992. Renal lesions on experimental a?atoxi?cosis in chickens. I.U. Veteriner Fakultesi Dergisi 18, 102?108. Dafalla, R., Yagi, A.I., Adam, S.E.I., 1987. Experimental a?atoxicosis in hybro-type chicks; sequential changes in growth and serum constituents and histopathological changes. Veterinary and Human Toxicology 29, 222?225. Espada, Y., Domingo, M., Gomez, J., Calvo, M.A., 1992. Pathological lesions following an experimental intoxication with a?atoxin B1 in broiler chickens. Research in Veterinary Science 53, 275?279. Fernandez, A., Verde, M., Gascon, M., Ramos, J., Gomez, J., Luco, D.F., Chavez, G., 1994. Variations of clinical, biochemical parameters of laying hens and broiler chickens fed a?atoxin?containing feed. Avian Pathology 23, 37?47. Giambrone, J.J., Diener, U.L., Davis, N.D., Panangala, V.S., Hoerr, F.J., 1985. Effects of a?atoxin on young turkeys and broilers chickens. Poultry Science 64, 1678?1684. Glahn, R.P., Beers, K.W., Bottje, W.G., Wideman, R.F., Huff, W.E., Thomas, W., 1991. A?atoxicosis alters avian renal function, calcium, and vitamin D metabolism. Journal of Toxicology and Environmental Health 34, 309?321. Harvey, R.B., Kubena, L.F., Ellisalde, M.H., Phillips, T.D., 1993. Efficacy of zeolitic ore compounds on the toxicity of a?atoxin to growing broiler chickens. Avian Diseases 37, 67?73. Howel, M.V., Taylor, P.W., 1981. Determination of a?atoxins, ochratoxin A, and zearalenone in mixed feeds, with detection by thin layer chromatography or high performance liquid chroma?tography. Journal of the Association of Official Analytical Chem?istry 64, 1356?1363. Ibrahim, I.K., Shareef, A.M., Al-Joubory, K.M.T., 2000. Ameliorative effects of sodium bentonite on phagocytosis and Newcastle disease antibody formation in broiler chickens during a?atoxicosis. Research in Veterinary Science 69, 119?122. Khajarern, J., Khajarern, S., 1999. Positive effects of Mycosorb against a?atoxicosis in ducklings and broilers. In: Poster presentation at Alltech's 15th Annual Symposium on Biotechnology in the Feed Industry, Lexington, KY.
Kiran, M.M., Demet, O., Ortatatli, M., Oguz, H., 1998. The preventive effect of polyvinyl?polypyrrolidone on a?atoxicosis in broilers. Avian Pathology 27, 250?255. Ledoux, D.R., Rottinghaus, G.E., Bermudez, A.J., Alanso-Debolt, M., 1999. Efficacy of hydrated sodium calcium aluminosilicate to ameliorate the toxic effects of a?atoxin in broiler chicks. Poultry Science 78, 204?210. Leeson, S., Diaz, G., Summers, J.D., 1995. A?atoxins. In: Leeson, S., Diaz, G., Summers, J.D. (Eds. ), Poultry Metabolic Disorders and Mycotoxins. University Books, Canada, Ont., pp. 248?279. Luna, L.G., 1968. Manuel of Histologic Staining Methods of the Armed Forces Institute of Pathology, third ed. McGraw-Hill, New York. Marquez, R.N.M., Hernandez, T.R., 1995. A?atoxin adsorbent capacity of two Mexican aluminosilicates in experimentally con?taminated chick diet. Food Additives and Contaminants 12, 431?433. Miazzo, R., Rosa, C.A., De Queiroz Carvalho, E.C., Magnoli, C., Chiacchiera, S.M., Palacio, G., Saenz, M., Kikot, A., Basaldella, E., Dalcero, A., 2000. Efficacy of synthetic zeolite to reduce the toxicity of a?atoxin in broiler chicks. Poultry Science 79, 1?6. > National Research Council, 1994. Nutrient Requirements of Poultry, 9th ed., National Academy Press, Washington, DC, pp. 44? 45. Oguz, H., 1997. The preventive efficacy of polyvinylpolypyrrolidone (PVPP) alone and its combination with the other adsorbents into broiler feeds against a?atoxicosis. Ph. D. Thesis. Institute of Health Sciences, University of Selc?uk, Konya. Oguz, H., Kurtoglu, V., 2000. Effect of clinoptilolite on fattening performance of broiler chickens during experimental a?atoxicosis. British Poultry Science 41, 512?517. Oguz, H., Kecec, T., Birdane, Y.O., Onder, F., Kurtoglu, V., 2000a. Effect of clinoptilolite on serum biochemical and haematological characters of broiler chickens during experimental a?atoxicosis. Research in Veterinary Science 69, 89?93. Oguz, H., Kurtoglu, V., Coskun, B., 2000b. Preventive efficacy of clinoptilolite in broilers during chronic a?atoxin (50 and 100 ppb) exposure. Research in Veterinary Science 69, 197?201. Oguz, H., Hadimli, H.H., Kurtoglu, V., Erganis, O., 2003. Evaluation of humoral immunity of broilers during chronic a?atoxin (50 and 100 ppb) and clinoptilolite exposure. Revue de Medicine Veteri?naire 154, 483?486. Olver, M.D., 1997. Effect of feeding clinoptilolite (zeolite) on the performance of three strains of laying hens. British Poultry Science 38, 220?222. Ortatatli, M., Oguz, H., 2001. Ameliorative effects of dietary clinop?tilolite on pathological changes in broiler chickens during a?atoxi?cosis. Research in Veterinary Science 71, 59?66. Ortatatli, M., Ciftci, M.K., Tuzcu, M., Kaya, A., 2002. The effects of a?atoxin on the reproductive system of roosters. Research in Veterinary Science 72, 29?36. Parlat, S.S., Yildiz, A.O., Oguz, H., 1999. Effect of clinoptilolite on fattening performance of Japanese quail (Coturnix coturnix japo?nica) during experimental a?atoxicosis. British Poultry Science 40, 495?500. Parlat, S.S., Ozcan, M., Oguz, H., 2001. Biological suppression of a?atoxicosis in Japanese quail (Coturnix coturnix japonica)by dietary addition of yeast (Saccharomyces cerevisiae). Research in Veterinary Science 71, 207?211. Quist, C.F., Bounous, D.I., Kilburn, J.V., Nettles, V.F., Wyatt, R.D., 2000. The effect of dietary a?atoxin on wild turkey poults. Journal of Wildlife Disease 36, 236?444. Qureshi, M.A., Brake, J., Hamilton, P.B., Hagler, W.M., Nesheim, S., 1998. Dietary exposure of broiler breeders to a?atoxin results in immune dysfunction in progeny chicks. Poultry Science 77, 812?819. Rosa, C.A., Miazzo, R., Magnoli, C., Salvano, M., Chiac, S.M., Ferrero, S., Saenz, M., Carvalho, E.C., Dalcero, A., 2001. Evaluation of the efficacy of bentonite from the south of Argentina to ameliorate the toxic effects of a?atoxin in broilers. Poultry Science 80, 139?144. Sell, S., Xu, K.L., Huff, W.E., Kubena, L.F., Harvey, R.B., Dunsford, H.A., 1998. A?atoxin exposure produces serum a fetoprotein elevations and marked oval cell proliferation in young male Pekin ducklings. Pathology 30, 34?39. Shotwell, O.L., Hesseltine, C.V., Stubble?eld, R.D., Sorenson, W.G., 1966. Production of a?atoxin on rice. Applied Microbiology 14, 425?429. SPSS 1999. SPSS/PC + V.10.0. Base Manuel for the IBM PC/XT/AT and PS/2. Marija and Morusis, SPSS Inc.
Sur, E., Celik, I., 2003. 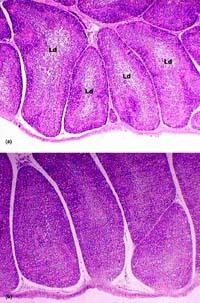 Effects of a?atoxin B1 on the development of bursa of Fabricius and blood lymphocyte acid phosphatase of the chicken. British Poultry Science 44, 558?566. Wild, C.P., Yin, F., Turner, P.C., Chemin, I., Chapot, B., Mendy, M., Whittle, H., Kirk, G.D., Hall, A.J., 2000. Environmental and genetic determinants of a?atoxin?albumin adducts in the Gambia. International Journal of Cancer 86, 1?8.